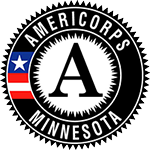 Owatonna, Minn., January 24, 2019 - Southern Minnesota Initiative Foundation (SMIF), in partnership with the Corporation for National and Community Service (CNCS), is seeking proposals from organizations within SMIF’s 20-county region interested in hosting full-time AmeriCorps VISTA members. The AmeriCorps VISTA program supports SMIF’s goal of creating economic vitality through entrepreneur development. Members are engaged with nonprofit organizations to build the capacity of programs and services targeted toward diverse populations who are experiencing economic hardship. The focus of VISTA members is to enable organizations to grow minority entrepreneurship through increasing financial literacy, and leveraging the assets of time, talent and resources to build systems to move individuals out of poverty. VISTA members do not engage in direct service activities. Their activities are designed to create a lasting impact on an organization’s ability to serve low-income communities through capacity-building. Additionally, VISTA members cannot be engaged in activities that could be considered replacement for a paid staff. Organizations interested in building processes and systems to move individuals to jobs or build prosperous businesses should apply for this one-year opportunity. VISTAs serve in 501(c) nonprofit organizations, educational institutions, faith-based organizations, tribal, state and local government agencies to build organizational capacity for conducting anti-poverty work. Organizations that focus solely on advocacy and lobbying are not eligible. The deadline for community partner site applications is February 22, 2019 at 4:00 pm. Site selections will be made by March 1, 2019, with the term of member service running from August 2019 through August 2020. This is a competitive application process, and SMIF will support up to three sites in the 20-county region. For guidelines and application, visit www.smifoundation.org/vista or contact Barbara Gunderson, AmeriCorps Director, at barbarag@smifoundation.org or 507-456-0353 for more information.